At work, cover yourself with safety you can trust in. Dress yourself in an Occunomix Men's Navy Blue Flame-Resistant Bomber Jacket FR JB. Cold, windy days mean the sparks will be flying. If you're outside and they fly toward you, this navy hooded jacket will s ... (see full details) (see specifications) #OCCFR-JB. At work, cover yourself with safety you can trust in. Dress yourself in an Occunomix Men's Navy Blue Flame-Resistant Bomber Jacket FR JB. Cold, windy days mean the sparks will be flying. If you're outside and they fly toward you, this navy hooded jacket will shield you from harm. 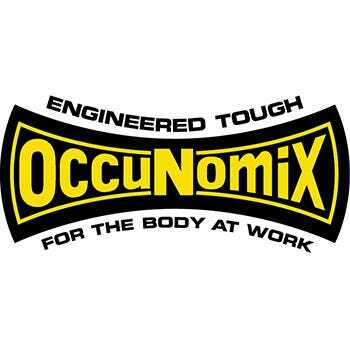 The Occunomix jacket's outer shell is made of 6-ounce, Flame Resistant, 100% cotton twill. It's FR properties meet ASTM F1506 and it has an Arc rating of ATPV 26 cal/cm2. The flame-resistant jacket also meets NFPA 70E requirements and its HRC=3. Layers of fabric and insulation keep this men's work jacket exceptionally warm. Lined with black, 10-ounce cotton twill, this Occunomix jacket has 3M Thinsulate Platinum insulation that's also FR. Thinsulate Platinum is hydrophobic, so won't hold water that can cause you to feel cold. But if the FR jacket does get damp because you're outside working in adverse circumstances, the insulation is still effective. And since the lining is made of silky fibers, it has a luxurious feel and gives the flame-resistant jacket a flattering drape. A removable, quilted hood gives you versatility on the job site. If you need total visibility to work, take the hood off, but if you need to shield your neck and hair, the hood offers additional safety. The safety jacket closes with a Nomex zipper. Nomex is another flame-resistant material, so the zipper resists fire and melting, things that can really hurt you on the job. A smooth, navy blue placket covers the zipper, offering a great look and another layer of protection to this hooded FR jacket. Simple clothing is best on the job site, and this men's jacket gives you just what you need. Two front pockets and two inside pockets provide a place for tools and necessary things like candy bars and keys, but aren't so large that you can weigh yourself down--you're not a tool box after all. On the side, this Occunomix FR jacket has an embroidered ARC rating, so you'll never forget what it's rated to (a good thing if there's a safety check). The Occunomix Skull logo also embroidered subtly on a small tag on one of the flame-resistant jacket's outer seams. Some work uniforms require navy blue clothing. When you also need safety wear that's flame resistant, it can be hard to find something that meets both you and your boss's needs. This Occunomix Men's Navy Blue Flame-Resistant Hooded Bomber Jacket FR-JB does just that. Look professional and be safe--order your new FR jacket today. I've purchased this jacket twice now. Thick, yet not stiff like a Carhartt, so it's very easy to work in and move around in tight spaces. Holds up relatively well, though gets susceptible to tears with age. Only complaint is inner lining (white/clear threads, like the stuffing inside the jacket) starts to poke through the outer layer of the jacket after a few washes. Didn't happen with my first one, only the second so may have been a defect. Occunomix Jackets: Men's FR JB Navy Fire Resistant Hooded Bomber Jacket is being added to your cart.